Did you ever wonder what it’s like to attend a player party? Outside the Ball was the exclusive media partner for the WTA Pre-Wimbledon Party and we’re taking you behind the scenes where all the action is! Among the flash of the photographers and screaming fans, the night kicks off with gorgeous designer looks as the women show off their own unique style on the carpet. Once inside, however, the real fun begins as you’re surrounded by music, food, and drinks. Our host Mayleen Ramey joins your favorite females like Serena Williams, Caroline Wozniacki, Carla Suárez Navarro, Sloane Stephens, Genie Bouchard and so many more on this magical evening. Join us as we give you this all access pass to party with the pros! 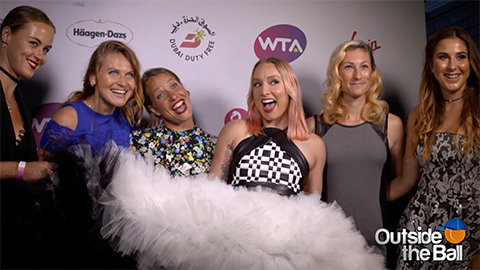 Go Behind the Scenes with Bethanie Mattek-Sands at the WTA Pre-Wimbledon Party It’s Player Party Time! See how Dominika Cibulkova Prepares for her Parties. Petra Kvitova’s Favorite Singer is a Punk Rock Pop Star Wimbledon Semi-Finalist Simona Halep, Kerber, and Li Na Have Great Dream Tennis Match Partners Heather Watson Wears the Perfect Dress for Singing in the Rain Did Dimitrov’s Wimbledon opponent Djokovic plant these difficult questions for him?